3.6 out of 5 based on 42 bloggers and 6 commenters. 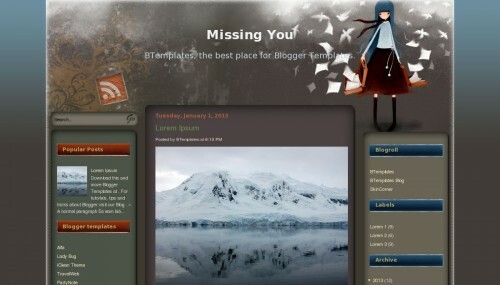 Missing You is a free blogger template with 3 columns, left and right sidebars, an exclusive design for Blogger, abstract, girly looking and gradients. Excellent template for blogs about animals, to write a diary or love. Finally I’ve found the perfect template for my poetry blog. i love it ! , but i have an issue with the share buttons. what can i do ? Love this so much, but the girl doesn’t fit with the theme. I wish I could replace it with another! Beautiful graphics, though!